Boutwell was an MK-19 machine gunner with Weapons Company, 3rd Battalion, 7th Marine Regiment, 1st Marine Division, 1st Marine Expeditionary Force, when the attack occurred during a routine patrol. "We were going on a patrol about to cross the Euphrates River, a spot we crossed about every day, and for some reason we stopped," Boutwell explained. "I looked to the left, and I heard a loud noise like an explosion, and everything went black after that." The thunderous explosion caused Boutwell to lose consciousness, but he was able to regain awareness moments later. "It felt kind of weird, but everything came crashing down to reality after a while," said Boutwell, who was a lance corporal at the time of the attack. "I could feel myself being pulled out of the truck, and I could hear my buddies yelling. I could hear and feel everything; I just couldn’t see anything. The last thing I remember was the wind from the chopper. When I woke up a few days later, I was (at Landstuhl Regional Medical Center) in Germany." Boutwell said he was transferred from Germany to the National Naval Medical Center, in Bethesda, Md., then to Brooke Army Medical Center, in San Antonio, where he stayed for two years and underwent 18 surgeries. 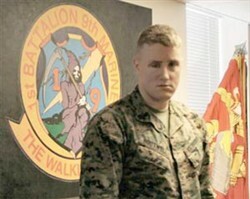 Despite his physical injuries, Boutwell depicted the pain of no longer being "in the fight" with his Marine brethren as one of the toughest things to overcome in his life. "Honestly, leaving Iraq was the worst time of my life," he said. "It was nice being around home for about the first month, because I got to see my family and friends, but then it tore me up inside knowing my buddies were still heavily engaged at the time (in Iraq)." Boutwell never lost his desire to be a Marine during the rounds of surgery and his ensuing recovery, but quickly found himself in another battle: the fight to re-enlist. "I didn’t want to get out of the Marine Corps, and I wanted to go back to Iraq," Boutwell said. "Headquarters tried to retire me from the Corps when I was stuck down in Texas for my surgeries. But I didn’t want to get out, so I fought the decision, and they finally let me lateral move to a different (military occupational specialty) and re-enlist. You've just really got to believe in being a Marine and believe in what you’re doing, and that’ll carry you as far as you want to go." Boutwell is now preparing for a second deployment in support of Operation Iraqi Freedom. "I feel good about going back to Iraq," Boutwell said. "I’ve been trying to go back for almost four years." Boutwell said he is excited about seeing the positive changes between his last deployment and his upcoming deployment. "I’m going to be happy to see the differences from the way it was (in 2004)," he said. "The last time I was there, we were in the middle of a firefight every day, and now it’s a lot calmer. I know just from my experience from being over there the first time -- we definitely made a difference over there." With the battalion’s deployment approaching, Boutwell has set a few personal goals to accomplish while in country. "I want to come home without a scratch, try to learn a lot while I am there, go out on patrols and get to see and talk to the (Iraqi people) -- you know, do something interesting," he said. Special Thanks to Pfc. Casey Jones, USMC, 2nd Mar Div, for this article and photo.